Birds are chirping, flowers are blooming, and we humans aren’t the only ones who are ready to say goodbye to winter weather. 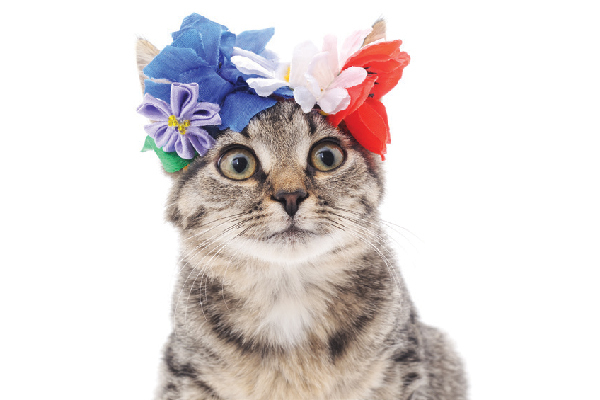 Here’s how you can tell your cat has come down with a serious case of spring fever. An indoor cat with a remote control yelling at a bird. Photography ©mokee81 | Getty Images. 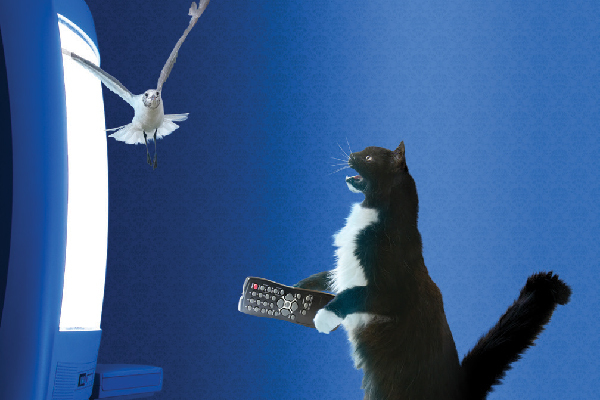 When spring is in the air, a new cast of avian characters gathers for every cat’s favorite reality show. Felines won’t want to miss a single moment of the action around the bird feeders or drama surrounding the babies popping up in neighborhood nests. What will become of the wee fledglings? Will the baby daddies be revealed? And who keeps dropping poop on the humans’ new patio chairs? The answers to these questions and more will be revealed. 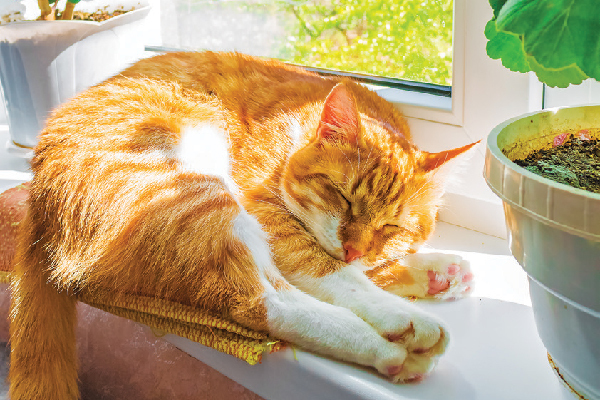 An orange tabby cat napping next to a sunny window. Photography ©Yuriyve | Getty Images. Sunny spring days mean one thing to cats: sun puddles! The days grow longer and so do the lives of the sunny patches that provide primo napping pleasure for our kitties. Who needs the crowded beaches of spring break when one can worship the sun in the comfort of his own home? A gray cat kissing an orange cat. Photography ©Voren1 | Thinkstock. 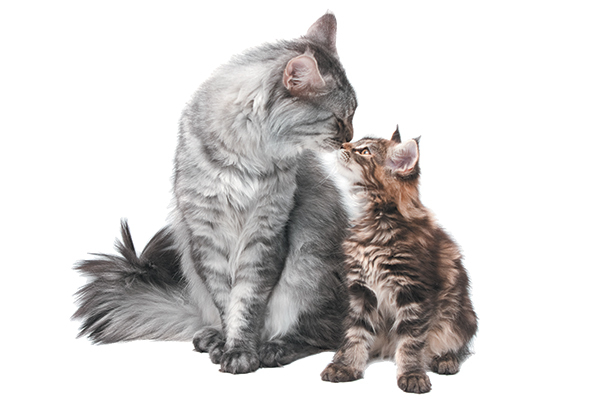 Springtime often spells L-O-V-E for cats who haven’t been spayed or neutered. Females howl away like they’re on stage at 2-4-1 night at the local karaoke bar, and the feline fellas line up for “dates” with these willing ladies. Just say no to bad karaoke: spay and neuter! 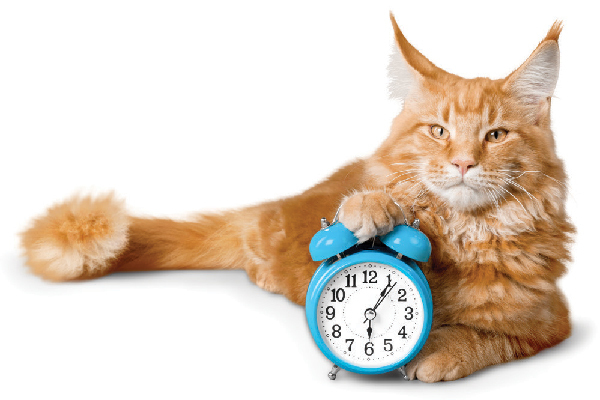 An orange tabby cat with a clock. Photography ©PeachLoveU | Getty Images. Cats can’t tell time, but they do know that when daylight peeks through the curtains, it’s time for us to haul our lazy butts out of bed and feed them. They don’t care if it’s an hour (or two) earlier than their prescribed mealtime — they just know it’s breakfast o’clock and they don’t have a snooze button. 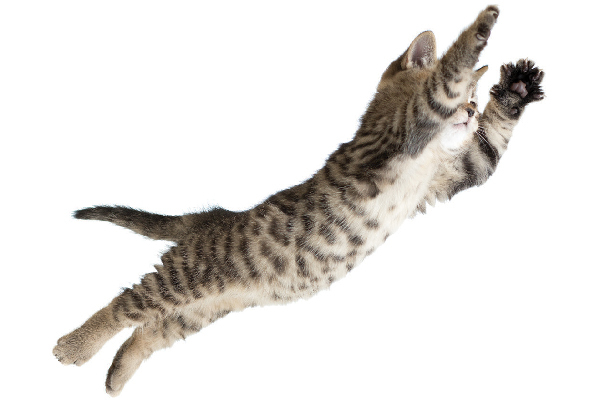 Cat flying or jumping through the air. Photography ©Andrey_Kuzmin | Getty Images. It’s nearly impossible to feel lazy when the glory of springtime is upon us. We humans find ourselves washing windows, organizing junk drawers and decluttering closets. Cats feel the zing in the air as well but have no closets to declutter. So what do they do with all that energy? Enter the zoomies. This is the highly technical term for the frenzied running, jumping and general crazy behavior cats exhibit when stricken with spring fever. No, there’s no way to stop the zoomies — we can only hope to contain them (but good luck with that). 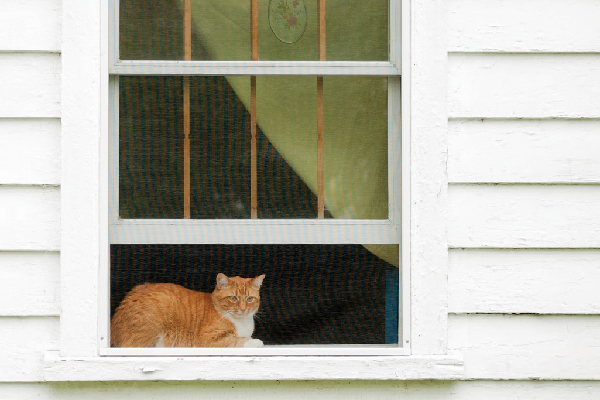 An orange tabby cat looking out the window. Photography ©Westhoff | Getty Images. What’s better than cracking a window on a gorgeous spring day, especially after months of cabin fever? Springtime scents like freshly cut grass, flowers and barbecues are a feast of fragrances. 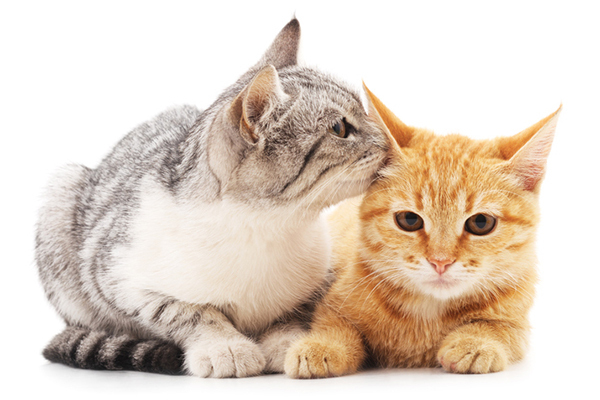 Cats have many more olfactory receptors than humans do, so their experience is extra feast-y. Open a window, and just watch them sniff away! 7. My, how you’ve grown! A mama cat and her kitten. Photography ©flibustier | Thinkstock. Growing kitties seem to experience a little spurt during the springtime months. They may like to use this time as an excuse to ask for more treats. Those zoomies sessions burn a lot of energy in these blossoming bodies, after all! 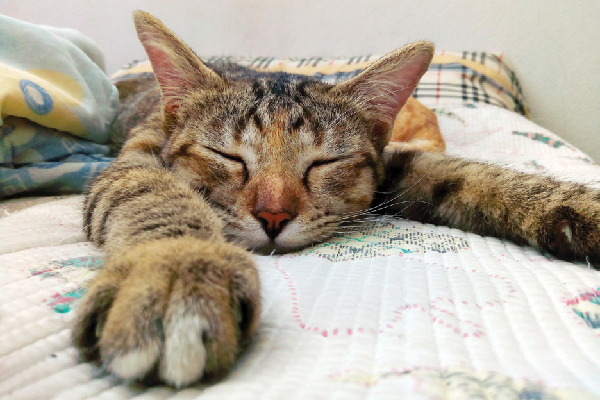 A brown tabby cat asleep on a bed. Photography ©artisteer | Getty Images. Kidding! Napping is still the No. 1 year-round hobby — because cats. Thumbnail: Photography ©Voren1 | Getty Images.